Soil music - because it's earthy! The band themselves coined this phrase to describe their music! Featuring western swing, bluegrass, country, gospel, folk, cajun and who knows what all else! And it's a big band (8 musicians!) packed with an array of instruments,big on sound, big on stage, big on entertainment in song and dance and really big on fun! Music, songs, dances, their own callers/performers, solid fun entertainment all night long whether you're dancing or listening to them! This band will make your event a really memorable one! 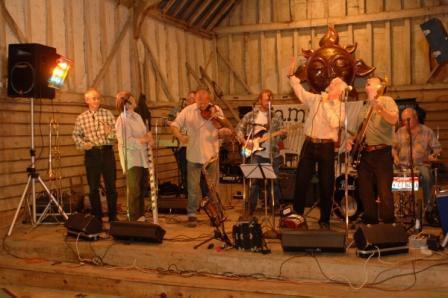 Andy Kershaw has described them as one of Britain's best barn dance bands, and the band has appeared on his BBC Radio 1, Radio 3 and World Service shows. The sample music, being one simple snippet, gives only an idea of the band's overall versatility. You will need to book well ahead for this very busy band!